In the very near future, Apple are going to release macOS Mojave and iOS 12. Because many of our customers like to upgrade their Macs, iPhones, and iPads as soon as new operating systems become available, we’ve been testing the latest versions of our apps with both new operating systems. As with all major operating system updates, it is a very sensible idea to be cautious about updating all of your computers and mobile devices at the same time. Although our testing of Light Blue 7 and version 4 of our iOS app has been positive so far, there is every chance that Apple could change something that breaks compatibility or that we’ve missed something because we can’t test every conceivable combination of devices and settings. If you rely on Light Blue to run your business, we would therefore recommend holding off from updating your operating system as soon as the latest versions of macOS and iOS come out. At the very least, if you absolutely must update on day one, make sure that you have at least one computer and iOS device on the ‘old’ operating system until you’ve had a chance to test that all of the features that you depend on are fully functional. Also, please note that our testing has been has been focussed on the latest versions of our desktop and mobile app. The vast majority of our customers are already using Light Blue 7.1.3 and version 4.2 of our iOS app, and if you’re using older version of either the desktop or mobile app then please update to the latest version to ensure that you’re able to take advantage of all of the new features and bug fixes that we’ve been adding. You can update the desktop app by using the ‘Check for updates’ command (in the ‘Light Blue’ menu if you’re on a Mac, or in the ‘Help’ menu if you’re using it on Windows), and you can update the iOS app via the App Store. We’ve released Light Blue 7.1.3, which is another free update to everyone who subscribes to our online services or has bought Light Blue 7. 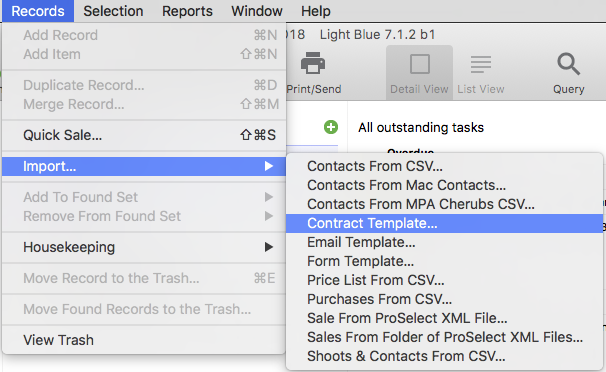 When you’re publishing a contract or form but not sending an email to your client, you can now open the contract or form in your browser as well as copying its URL to the clipboard. The “Print/Send” checkbox in the print dialog now defaults to whatever you last set it to, so if you prefer to create invoices without printing them then you no longer need to un-check that box every time. Added a 24 hour option to the built-in calendar’s week and day views. If an email doesn’t already have attachments, you can now drag attachments onto the ‘Add Attachment’ button. You could already drag attachments into the list of existing attachments. In the query dialog, you can now search on incoming data fields when you’re querying for shoots. You can now query for records that have notes, tasks, or documents that are linked to a particular member of staff. 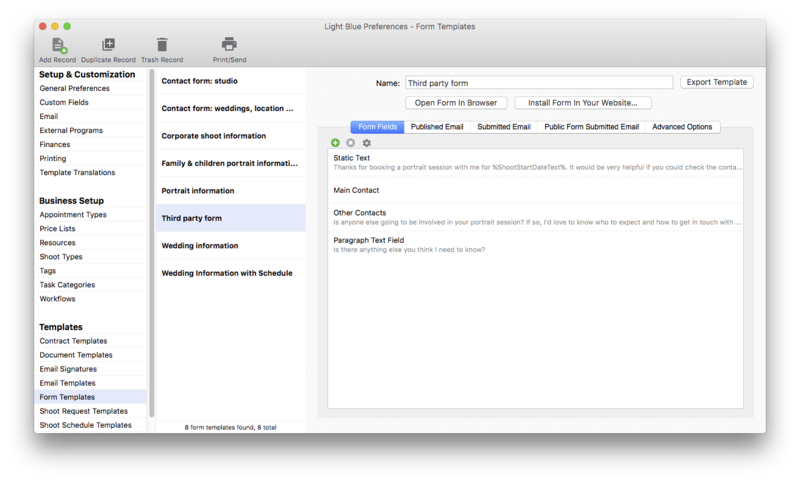 Added %ContactBirthDateDay%, %ContactBirthDateMonth%, and %ContactBirthDateYear% mail-merge tags. Added support for detecting forwarded messages from the iOS version of Mail and the macOS version of Outlook. The dialog for setting up sending a batch of text messages now closes automatically after you send or schedule your messages. When you open the appointment editing dialog, the cursor will default to the start time field if the appointment doesn’t already have a start time. If your country setting is set to one of France’s international territories, we now apply the French address format. Fixed a problem where pasting text into an HTML editor on Windows could paste it in the wrong place. Fixed a problem where you couldn’t paste formatted text into an HTML editor. Fixed a problem that meant that you could only drag-reorder form fields if you kept your mouse near the left hand edge of the list of fields. Fixed a problem on macOS where tabbing into an HTML editor required hitting the Tab key twice. Fixed a problem where reschedule tasks that are scheduled for the same day could fail to reschedule some of those tasks. On some dates, the “Last 12 months” date range in Charts view could show the wrong results. Fixed a problem with the HTML editor that could make it hard to add a space in a specific place. Fixed a crash that could occur when opening the Charts view. Fixed a bug where the %ShootRequests% mail-merge tag didn’t include some requests. Light Blue allows you to send text messages to your clients, which is great for appointment reminders and marketing. Via our dedicated number service, which is available in most countries. 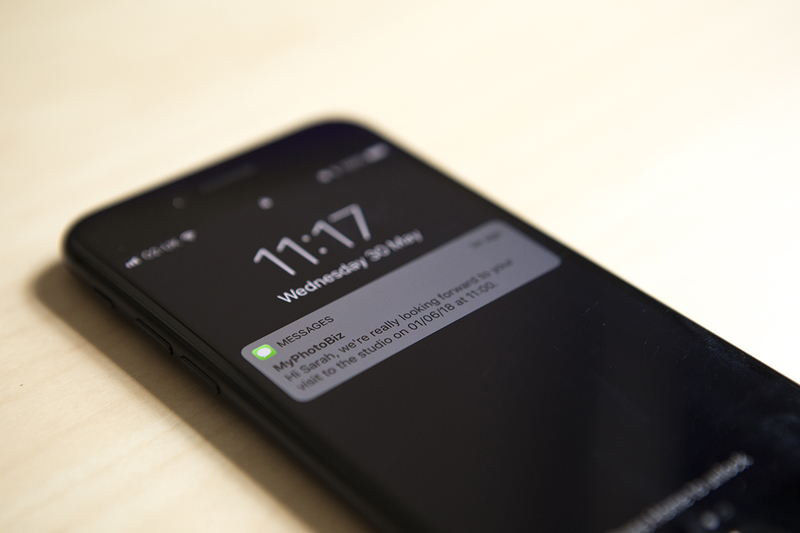 Or, if you’re based in the UK, Ireland, or Australia, you can send messages that appear to come from your personal mobile number or a short name. With our dedicated number service, you rent a phone number from us. The text messages that you send from Light Blue come from this number, and any replies that your clients send will appear in the Inbox in Light Blue. We can also forward clients’ replies to your personal phone number if you want to know about replies as soon as they arrive. This will cost you credits, because we’re effectively sending the message out again. If someone tries to call your dedicated number, they’ll get an automated message saying that it can’t take calls. 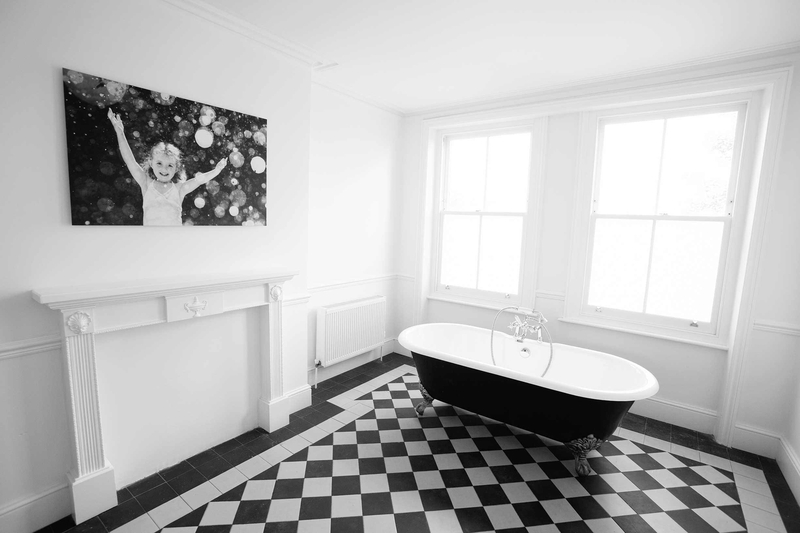 We can customise the message for you: just tell us what you’d like it to say. This service is available in most countries. Renting a dedicated number from us costs £5 per month, and text message credits 7p each for UK numbers (please contact us for international pricing). If you would like us to set up our dedicated number service for you, please get in touch via email! 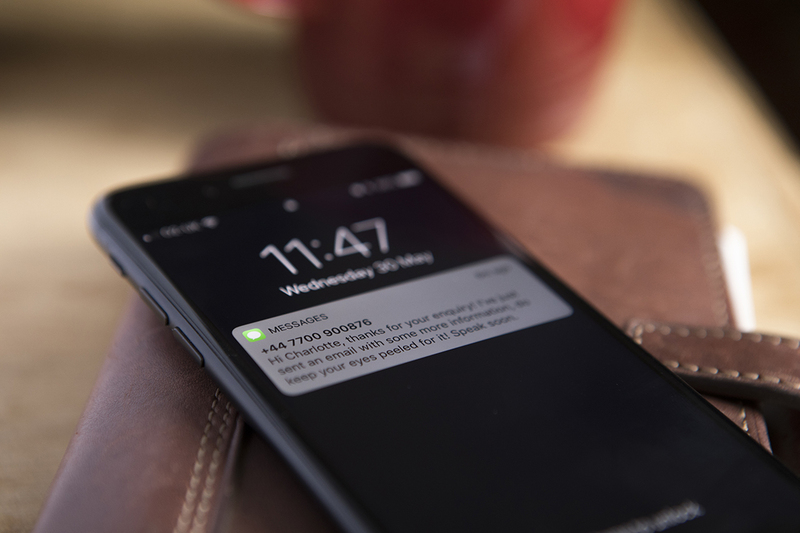 Customers in the UK, Ireland, and Australia can use a version of our text messaging service where messages sent from Light Blue will appear to come from either your personal phone number or a short name. This service can work in some other countries, but the local phone companies might change the number that the message appears to come from. There is no monthly fee for using this version of our text messaging service, and text message credits cost between 7p and 9p depending on the quantity that you buy. If you’re using a From Name, text messages appear from a name that can be up to 11 letters and numbers without spaces. Your customers can’t reply to those messages, because SMS only allows you to reply to a phone number. This is useful when you want to display your business name as the sender and don’t want/need to receive replies. 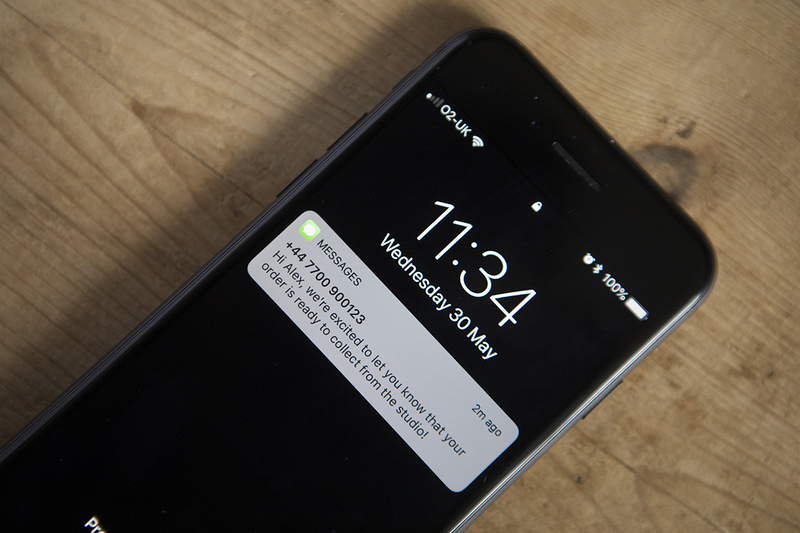 If you’ve set a “from number”, text messages appear to be sent from your own mobile phone number. 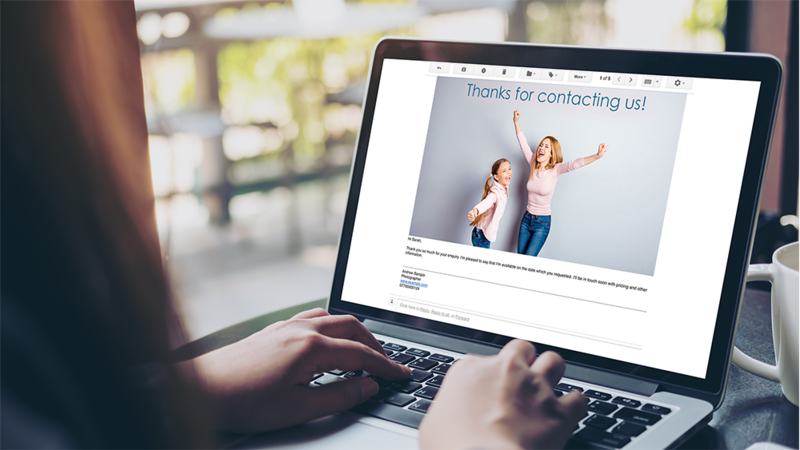 Replies will go to your own mobile phone number just like any other text message, but replies from your clients aren’t imported into Light Blue (you need to use the dedicated number service in order for your clients’ replies to arrive in Light Blue). We’ve released Light Blue 7.1.2, which is another free update to everyone who subscribes to our online services or has bought Light Blue 7. Like all of our minor updates, Light Blue 7.1.2 includes a variety of feature updates and bug fixes. We’ve also added a bigger feature that will help photographers who are keen to keep clients on their mailing list while making sure that they’re complying with the new GDPR regulations. If you want to send mailing list opt-in links to lots of clients, you can export a CSV file of contact names, email addresses, and URLs from Light Blue. You can then import this spreadsheet into a service like MailChimp to email it to your clients. To do this, find the contacts or shoots that you want to send this to, go into the Housekeeping section of the Records menu and use the ‘Ask Clients To Opt-In To Mailing List’ command. If you only want to send mailing list opt-in links to a small number of clients, you can use the %ContactMailingListOptInURL% mail-merge tag in an email template. If you want to customise the text of the link in your email templates, you can do so be using a tag like %ContactMailingListOptInURL:Click here to open the form%. 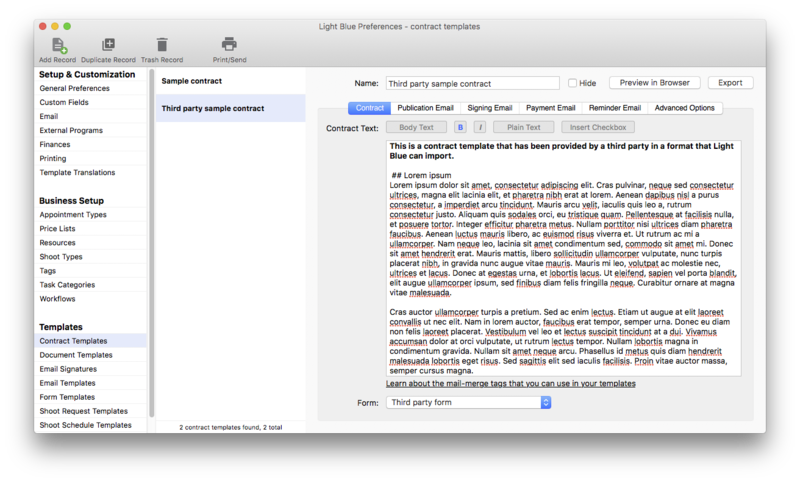 We’ve included a sample email template in this update. You can find out more about this feature in our blog post that explains how to use it. You can now customise more of the text that appears in your client portal when clients are signing contracts. You’ll find these customisable text options in the ‘Template Translations’ section of the Preferences window. The following Sale reference values are now available in the query dialog, list views, and data exports: purchase order references, shopping cart references, courier references, client job number references, and quote references. Added support for reading the original sender details from emails forwarded from Outlook for macOS to your unique Light Blue email address. When you’re running a tax report, you now need to confirm that you want to mark the included records as claimed. Added an option to use the shoot reference as the default prefix when you’re importing pictures for a shoot. When creating a Sale record from a Quote, you’re now warned if the booking fee is greater than the quote’s total. 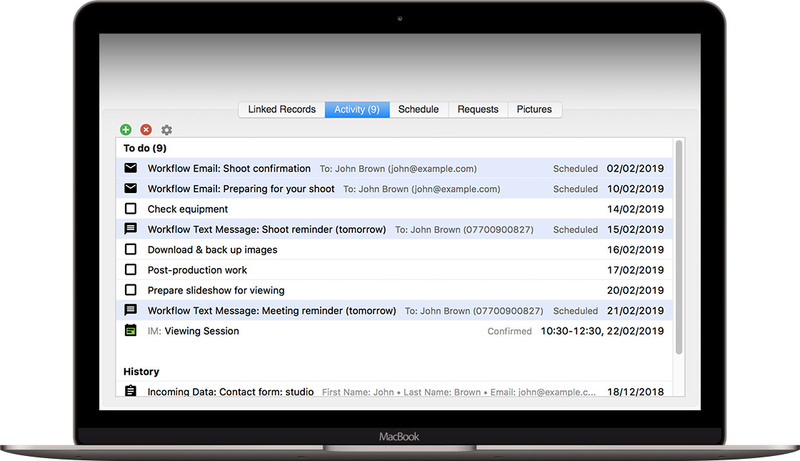 Added a “Email & Client Portal Branding” heading to the ‘Printing’ section of the Preferences window. This is to make it bit clearer where you need to go to adjust those branding settings. Revised the wording of the “database upgrade required” dialog to make it less intimidating. Fixed a rare problem where publishing an appointment to macOS calendars could make it appear at 12:00 instead of the correct time. Fixed a problem on Windows where the email templates panel could end up with its scrollbar set to the wrong position. Fixed a problem where clicking the “Save and add another” button in a form field dialog could fail to add the new item. When changing a form field from a type that includes a ‘Description’ option to one that doesn’t, the description is now removed properly. Fixed a problem that could affect rounding numbers to zero. The quick sale dialog now works with European decimal separators. The ‘add workflow’ dialog no longer gets stuck if you try to add a workflow based on a really old date. Fixed unexpected quits that have been reported to us.